If you are new to the 21 Day Fix program it can certainly be a little overwhelming when your program first comes in. You get color-coded containers for the diet, the workout DVDs, the workout schedule, a quick-start guide, a 3 Day Quick Fix guide, and an 84 page eating plan…oh my! In this post, I’m going to provide you with the 21 Day Fix tools I personally used when I followed the program, and those tools I feel would help people just starting out on their journey with this program. Diet – Tally sheets for tracking which containers you’ve used for the day, and a custom 21 Day Fix meal planner(download link) to be able to visually lay out your meals for the day or for the week. Workout – The 21 Day Fix workout schedule is 21 days with one workout per day for weeks 1 and 2, with the third week being an optional doubles week, meaning two workouts in one day. 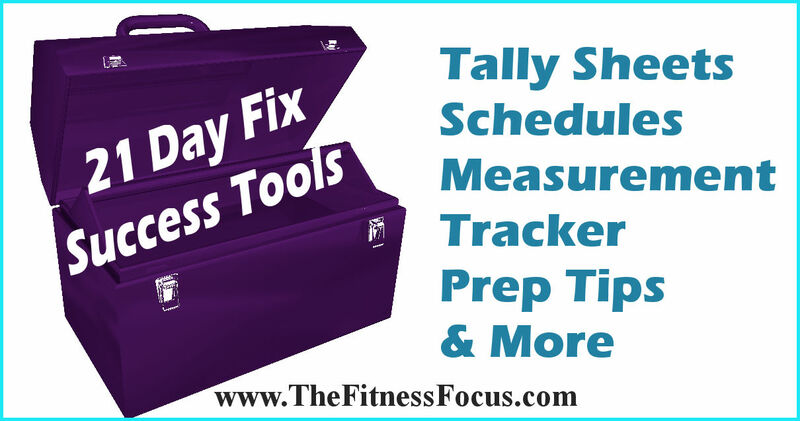 Measurements – Page 7 of the 21 Day Fix Quick Start Guide contains the transformation tracker. I also have a weekly measurement tracker(download link) if you’d like to keep track of your weekly changes. Calorie & Container Level – Here is a quick cheat sheet for calculating your container levels. This is good to have on hand if you need to move down levels. When following the 21 Day Fix diet, having at least some of your meals prepared ahead of time can be huge time saver. It’s not really feasible to use the containers that come with the program to store your daily food, since many containers you will be using multiples of each day. I believe it is much easier to measure your foods with the portion control containers, and then use another container to store the food in. Salad Kit or Mason Jars – Lunch for me during the week is often a large salad with cut veggies, a lean protein, and a healthy fat. To keep your salad from getting soggy, you ‘ll want to try your best to keep some of the ingredients separated. 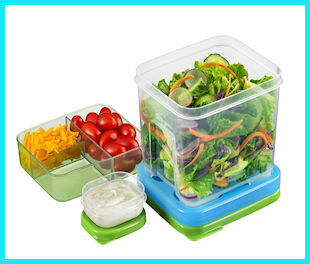 A salad kit to keep your salad ingredients works wonders to keep salad fresh. Or, you could try using mason jars for storing salads. 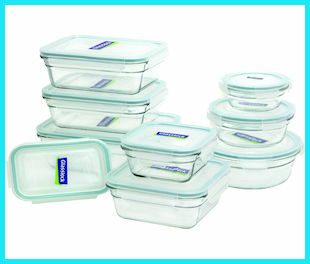 Glass Tupperware – Chemicals in plastics can leach into your foods, but how much? That’s a scientific debate. If you are going to be storing food for extended periods of time and/or reheating, I would strongly suggest using glass Tupperware or at least bpa-free plastic. Non-porous glass will not leech chemicals, can be cleaned at high high heat to kill germs and bacteria, plus your food will just plain taste better. The downside of glass containers is they can make your lunch bag pretty heavy! There is strength training in the 21 Day Fix workouts, and you will need resistance to get the most out of these workouts and get the best results. The two best options are a couple set of light dumbbells or a resistance band. Resistance bands provide tension that increases as the bands are stretched. Dumbbells resistance is caused by gravity which provides the same resistance at all points. A true beginner could probably get away with a resistance band only, but as your strength increases, a couple sets of light dumbbells are going to likely be needed. A dumbbell set that includes sets of 3 lb, 5lb, and 8 lbs dumbbells a storage rack is a good starting weight point for beginners. To increase weights you can always hold two weights of varying weight in each hand. Resistance bands can also be used, as the bands expand they provide greater tension. The 21 Day Fix Eating Guide originally came with very basic recipes for using the containers. Think mostly mixed veggies or scrambled eggs as recipes. It was actually one of my main complaints when I first reviewed the program. 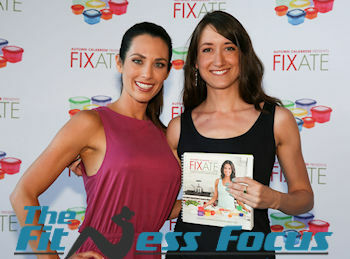 Since the initial program release, Autumn and Beachbody has produced a cookbook dedicated to the 21 Day Fix called FIXATE. I believe you can only order a physical copy of the book at his point, but perhaps an online version of FIXATE will become available in the future. Another great resource for 21 Day Fix recipes is Pinterest. Many food bloggers have fallen in the love with The Fix and will share recipes there. Just be careful when using a third-party sources as you want to make sure the recipe is only using 21 Day Fix-approved foods, which I notice many do not. Sure that looks and sounds delicious, but it’s not really sticking to the diet plan. 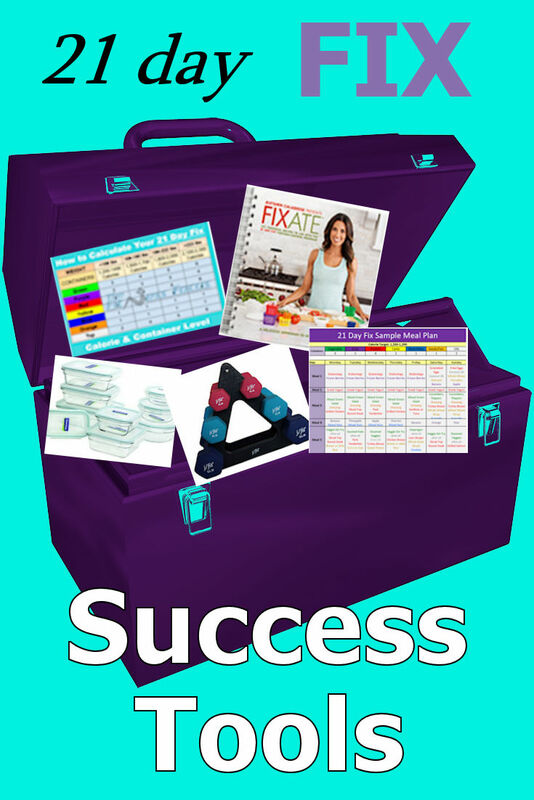 The 21 Day Fix is a simple program to follow and with these tools it could not get much easier. What is your favorite 21 Day Fix resource? Did I miss something you feel should be added? Please comment below. My hope is to inspire and motivate you to take 100% control of your health, your fitness, and your goals in life. Looking into purchasing fixate book and 3 month BOD. Its asking for a coach ID for referral. I am looking if you have a referral code? Another great free tool is the 21 day fix app! My savior! Hi Bethany,i got ur mail today.thanks.I’m struggling with my last 15 pounds.i started 21 day fix 6 months back.but I never completed my 3 weeks.Again I started this Monday,Today is my 4th day.Meals I prepared almost healthy only,honestly sometimes I snacks kids cheese bar,chocolates.wanna change my habit,past 4 days i ate portion sizes. Hi, I'm Bethany! And I am very happy that you found my site! I began this blog as a way to record my own health and fitness journey. I share what has worked for me and what hasn't to help you. Subsrcibe to get my latest blog posts, fitness tips, & printables. @2018 - TheFitnessFocus.com. All Right Reserved.